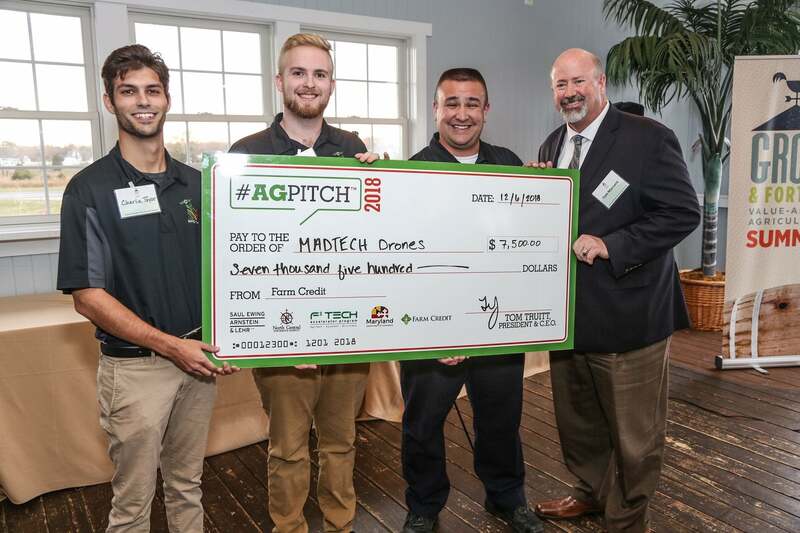 Congratulations to MADTECH Drones, AgPitch18 Winner! AgPitch18 was held on December 6 at the Grow & Fortify Value-Added Agriculture Summit, at the Chesapeake Bay Beach Club in Kent Island, MD. AgPitch18 was an open competition for those who have innovative ideas to enhance the agricultural and aquacultural industries. You can read more about the five companies that were finalists for AgPitch here. After October 31 deadline, the applications were reviewed by judges from TEDCO, MARBIDCO, Institute of Applied Agriculture at University of Maryland, Maryland Department of Commerce, Maryland Extension and other industry leaders. The five applicants with the most viable and innovative concepts were chosen to present their ideas to a panel of judges at the Grow and Fortify Value-Added Agriculture Summit. Each applicant had five minutes to pitch their ideas, and the live audience and judges voted for the winner. In addition to winning the grand prize of $7,500 to help them launch their business, MADTECH Drones also receives risk management services (provided by North Central Insurance Agency), office space (provided by the Maryland Business Incubation Association and F3 Tech Accelerator Program), and admission into Saul Ewing Arnstein & Lehr’s Resources, Access, and Mentoring Program (RAMP). All of finalists received cash prizes and admittance into the F3Tech Pre-Accelerator program. Please send any questions, suggestions and comments to Andrew Rose.